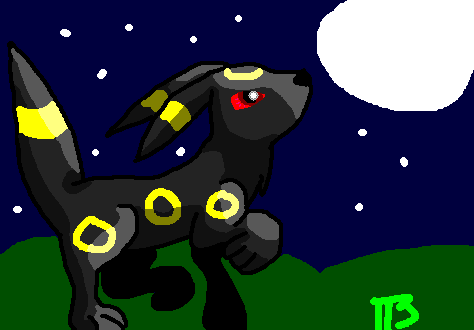 Yeah, a moonlit Umbreon for shadowbender. I hope you like this! Favorites... 7 Keywords HAPPY, POTATO, DAY!!! ooohhhhh!!! ME SO LIKEY!!! IT LOOKS LIKE IT IS TRYING TO HIDE INTHE DARKNESS LIKE THE GREAT VAMPIRE-ZOMBIE-WEREWOLF!!!! MWAHAHA!!!!!! Whoa that's gorgeous! You know that on Colosseum the Umbreon kinda fades in and out with a Gold outline, if it helps at all. wow!! this was so nice! !